The McGill Vis moot team, composed of students Alex Dobrota, Maha Hussain, Sarah Walker and Mathieu Kissin, recently returned from Vienna, where they competed in the 17th annual Willem C. Vis International Commercial Arbitration Moot. This year's competition, held from March 26 to April 1, 2010, saw teams from 255 schools representing 62 countries. According to alums Eric van Eyken (BCL/LLB'09) and Martin Doe (BSc'04, BCL/LLB'08), who assisted Professor Frederic Bachand in coaching this year's team, "the McGill team distinguished itself admirably, advancing from the 4 initial rounds, to the first elimination round of 64 and from there, to the round of 32." In addition, the team was granted an honourable mention for their respondent's factum, placing their written work in the top 10% submitted at the competition. Maha Hussain also earned an individual honourable mention for her oral advocacy skills, a status awarded to the top 15% or so of pleaders. All four Canadian teams participating this year - McGill, Osgoode, Ottawa and Queen's - made the elimination rounds, with Ottawa prevailing against Osgoode in the semi-finals and going on to place second in the final. "Canada's 'Own the Podium' efforts are continuing to pay dividends," joked Bachand. The team wishes to thank Professors Tom Carbonneau, Catherine Walsh, H. Patrick Glenn and Armand de Mestral for their support and advice during practices. Thanks are also due to a number of prominent arbitrators who kindly agreed to judge practice moots in Montreal, in preparation for the competition: Christopher Richter of Woods LLP; Leslie Beck from Gravenor Beck LLP; Eric Ouimet, Frédéric Côté, and Ronald Audette at BCF; and Geoffrey Conrad & Martin Valasek at Ogilvy Renault. The team also had the benefit of generous advice from the following alumni in both Montreal and Vienna: Paula Viola, Élise Béland, Anja Grabundzija, and Peter Wright. The Faculty offers the team and its coaches its warmest congratulations. The Willem C. Vis International Commercial Arbitration Moot is an international competition held annually in Vienna, Austria. Its goal is to foster the study of international commercial law and arbitration in the resolution of international business disputes, through its application to a concrete problem and to train future law leaders in methods of alternative dispute resolution. 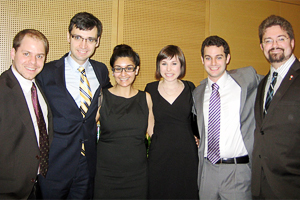 Pictured, in the usual order: Martin Doe, BSc'04, BCL /LLB' 08, Alex Dobrota, Maha Hussain, Sarah Walker, Mathieu Kissin, and Eric van Eyken, BCL/LLB'09.